Dana and her loyal rescued dog, Grit. 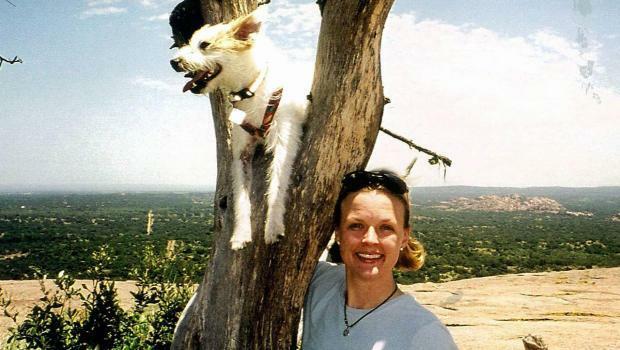 Dana loved her dog Grit, whom she rescued. She was known for rescuing dogs and about every other kind of animal. When the family was planning her service and they were looking for ideas to pay tribute to such a wonderful person, her brother said “puppies”. Yes, they brought puppies to the service from the local adoption shelter and guess what, every puppy was adopted at the service. What a fabulous tribute to Dana and her legacy lives on. For more great ideas for a funeral, memorial service or celebration of life visit us. This entry was posted in Ideas for creating a memorial, Life Celebration Ideas, Uncategorized and tagged bring dogs to funeral, celebration of life, funeral ceremony, funeral ideas, ideas for a life celebration, ideas for unique funeral, life celebration ideas, pets at a funeral. Bookmark the permalink.